Udupi: July 5, 2015: Pramod Madhwaraj, MLA, said on Saturday that two vented dams would be constructed in two separate places in the Udupi Assembly Constituency under the Multi-Village Scheme to solve the drinking water problem in rural areas. He was chairing a meeting of Zilla Panchayat members, Taluk Panchayat members, Presidents of Gram Panchayats and Panchayat Development Officers on drinking water supply in Udupi Assembly Constituency. Mr. Madhwaraj said that one vented dam would come up at Kokkarne village, while the other vented dam would be constructed at Cherkady. The preliminary survey work for these two vented dams had been completed. A Detailed Project Report for these dams was being prepared. Hence, when officials came to the villages to collect details of water availability, all the Zilla Panchayat, Taluk Panchayat and Gram Panchayat members should be ready with their lists of houses, which did not have water supply. It was essential that all houses in all villages got water connection without any political considerations. 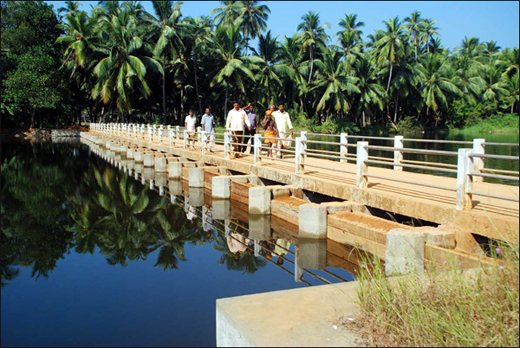 These dams would ensure water supply to 26 villages in the Udupi Assembly Constituency. Already Rs. 80 lakh had been release for this purpose. However, some villages such as Kenjur, Kalathur, Nalkur and Nanchar had not been covered under the Multi-Village Scheme. A separate survey would be conducted for these villages, Mr. Madhwaraj said. Mallika Balakrishna, Zilla Panchayat member, said that Bennekudru, Harady and Baikady village always faced chronic drinking water problem. Satish, Assistant Executive Engineer, said that efforts would be made to solve this problem. When the meeting was informed that water supply pipelines were getting broken during the construction or repair work of State and National Highways, Mr. Madhwaraj directed the Panchayat Development Officers to write to the Public Works Department for breakages of pipelines during the construction/repair of State Highways. They should write to the Director National Highways for breakage of pipelines during the repair/construction of National Highway. “Both the PWD and National Highways Department should pay if the pipelines have broken during their works,” he said.